Merr left Williamsburg, Virginia, about 40 years earlier [ca 1792]. Last heard of in Boston, Massachusetts. 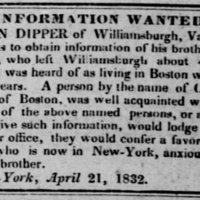 Dipper is searching for him or Cesar Lafayette, who knew his brother Daniel Merr well. An antebellum ad. fayette, of Boston, was well acquainted with Merr. New York, April 21, 1832. 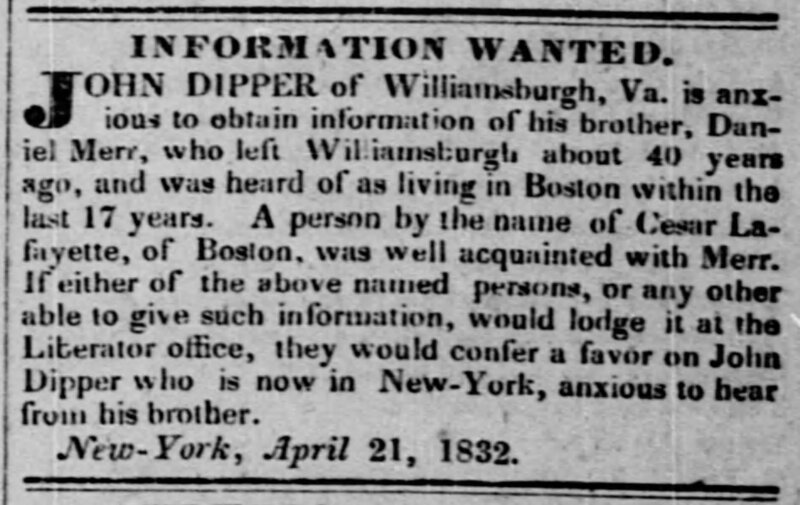 “John Dipper searching for his brother, Daniel Merr,” Information Wanted Ad, Liberator (Boston, MA), April 28, 1832, Last Seen: Finding Family After Slavery, accessed April 19, 2019, http://informationwanted.org/items/show/3302.